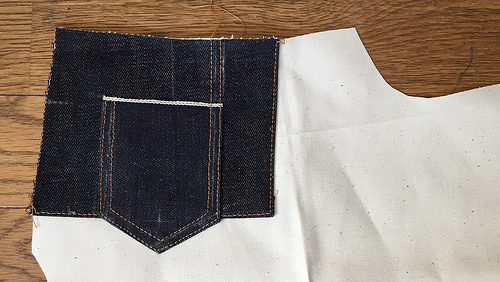 Sometime ago I posted that I wanted to make a pair of selvedge jeans for my husband and have started making the muslin. It turned out that ‘sometime ago’ meant 8 months ago! Yikes. 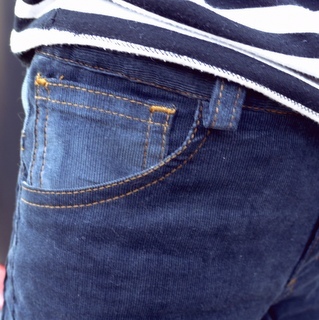 The good news is, the jeans are finally finished now! And actually it only took me two days to make them, just in time for my husband’s 44th birthday! 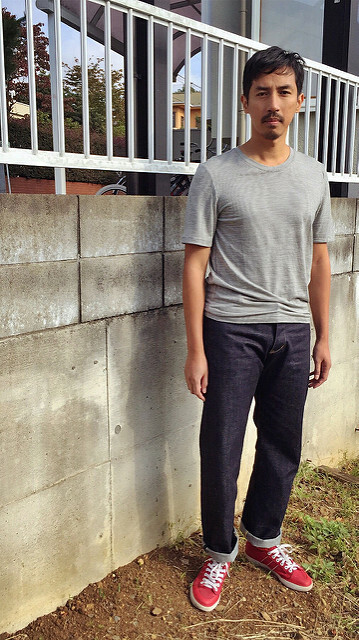 The pattern is Men’s jeans FOP-07 by Full of Patterns, a Japanese pattern shop. The site is completely in Japanese but it wasn’t a big problem as I always use Google translate extension on Chrome to browse and even order things from Japanese sites. This pattern shop offers many great-looking men’s pattern, unfortunately they don’t seem to cater for international customers. 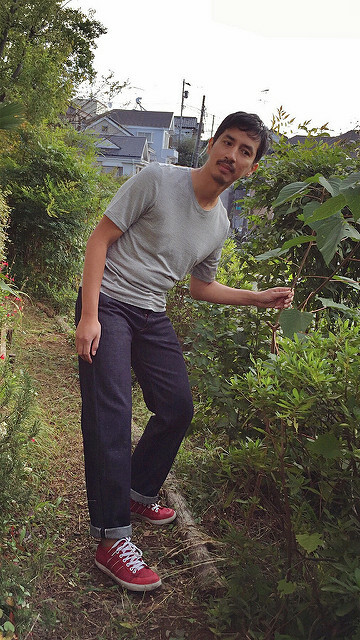 The FOP-07 is a basic 5-pocket denim pants with straight side seams for selvedge denim and straight legs. 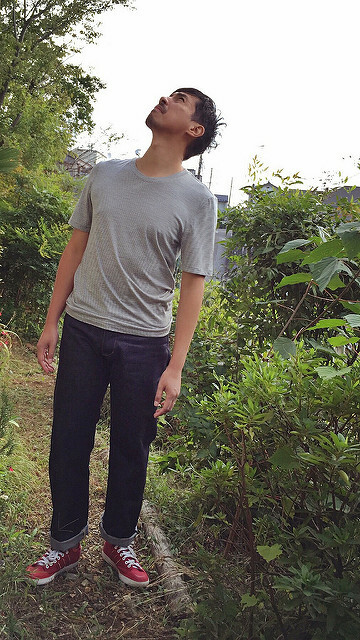 The denim fabric is from another Japanese shop, Citron jeans. 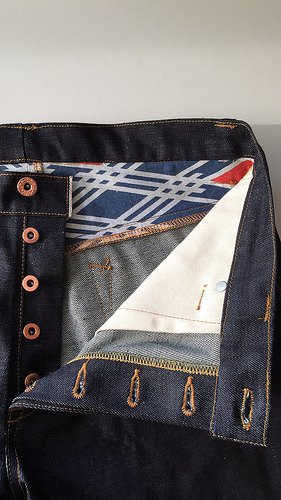 This shop sells raw denim, buttons, and all the knick-knacks for sewing your own selvedge jeans. 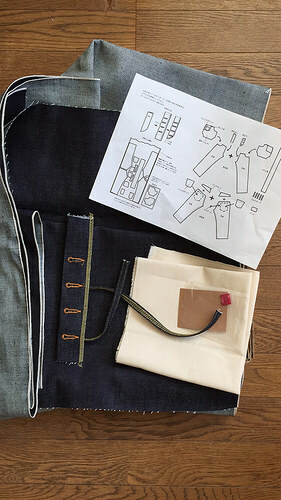 Citron jeans also sells denim kit in a box, containing raw denim for one pair of jeans, pocket lining fabric, uncut belt loops, zipper or button fly, red ribbon tab, and brown paper label. 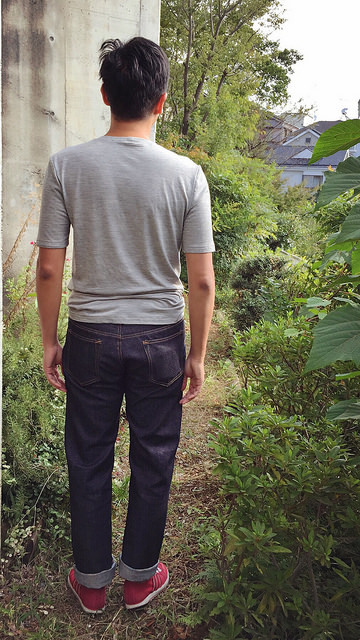 I bought Denim kit no.348 with button fly, the fabric is 13.5 oz raw denim with red ear (selvedge). 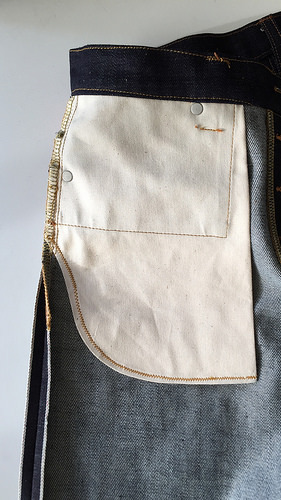 I’m not really a fan of making buttonholes on denim fabric so I love that there are kits like these. 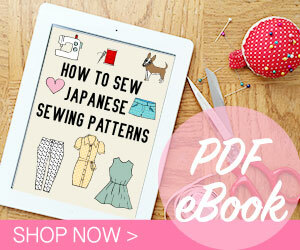 The kit that I chose is recommended for beginner as the fabric is soft and easy to sew. I also bought topstitching threads, rivets, and donut buttons from this shop. 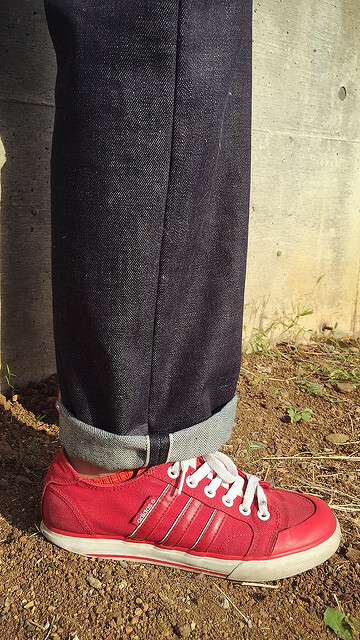 In my first post about this jeans, I have made a muslin. But then I didn’t seem able to locate it! I didn’t want to postpone this project any longer so I decided to just cut into the fabric. What can go wrong anyway?? 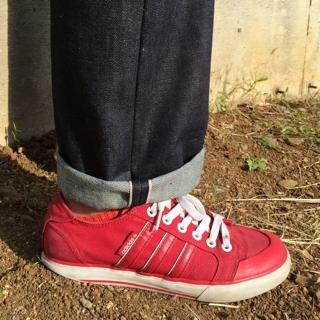 Once they were cut, I felt more relaxed and started to enjoy making the jeans. 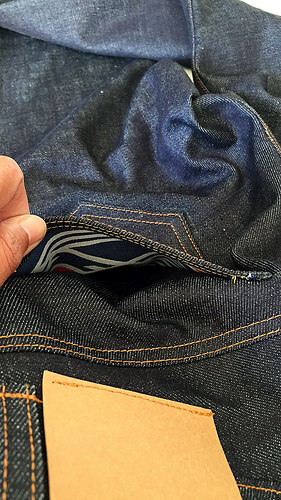 One of the joy of making jeans is making the details: the color of topstitching threads, the shape of the topstitching on the pockets and fly, the button or zipper fly, the button, rivets, and bar tacks etc. 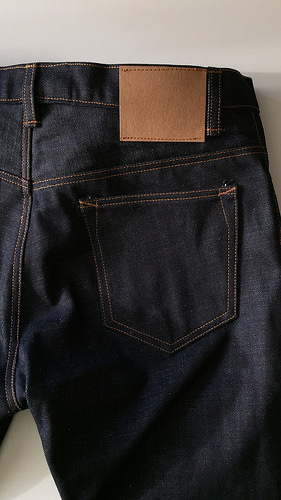 For this jeans, I use rust colored topstitching and copper colored rivets and button. 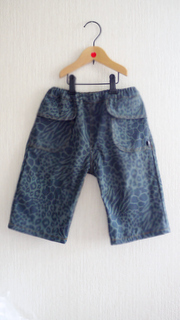 The back yoke and back pockets are lined with Japanese pattern cotton fabric. 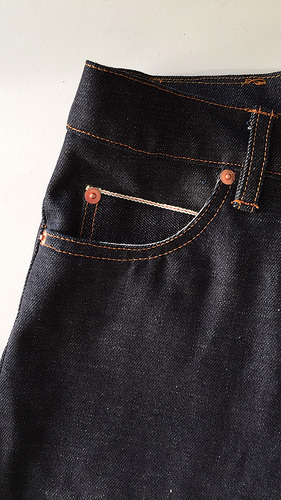 The opening of the front pockets are reinforced with cotton twill tape. 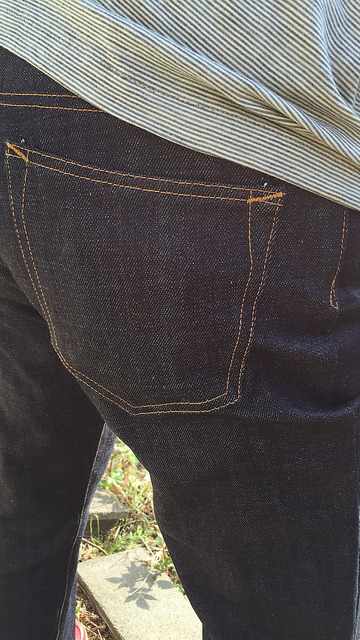 The selvedge is used on the coin pocket opening and the waistband edge, and of course the side seams. 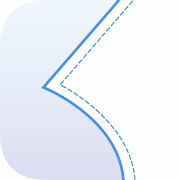 I also changed the shape of the coin pocket and use button fly instead of zipper fly. 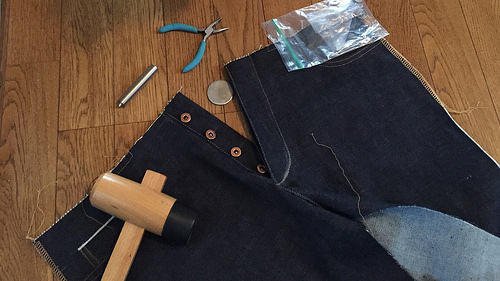 Here is a tutorial on making a button fly by Peter at Male Pattern Boldness. 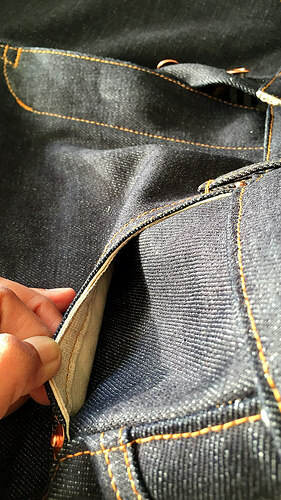 I ended up making my own belt loops because the one from Citron jeans use yellow topstitching. 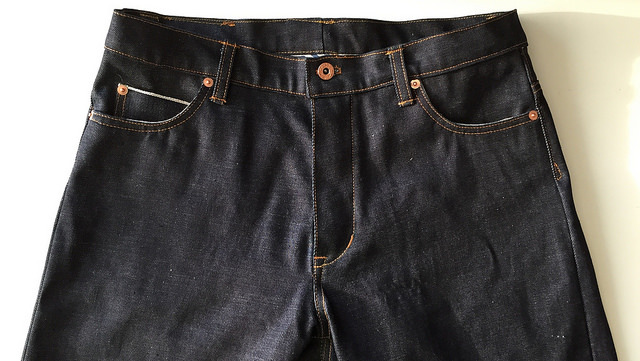 My least favorite part about making this jeans was the topstitching on the waistband. 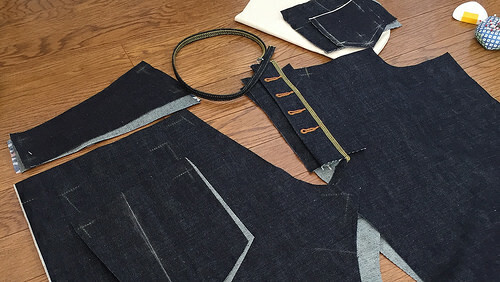 I wasn’t able to make neat lines because the denim was quite thick. Usually I would unpick such wiggly topstitching but I was afraid to ruin my sewing machine with all the thick layers so I had to resign to these unsightly lines. I also had trouble installing the donut button and had to try several times until I got them somewhat okay. Maybe I should use one of those hand pressed button tool. 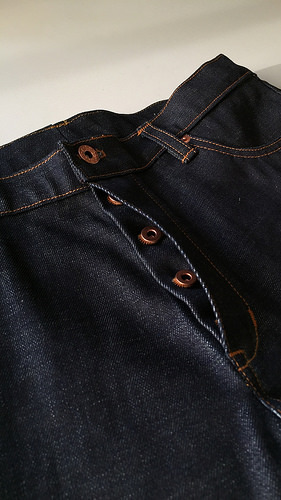 Tack buttons are easier to install, I usually use Prym jeans button but the options are limited. Nothing as beautiful as these copper colored button! I also made the T-shirt by the way. The pattern is Strathcona Henley by Thread Theory, the T-shirt variation. It is a great basic Men’s T-shirt with slim fiitting lines. The fabric is striped merino wool fabric, you might remember the same fabric in my SJ tee post. Now my husband and I can wear matching handmade tee and jeans (if we want). Sorry for posting so many pictures! This is one of my favorite project that I wouldn’t be able to make more often. 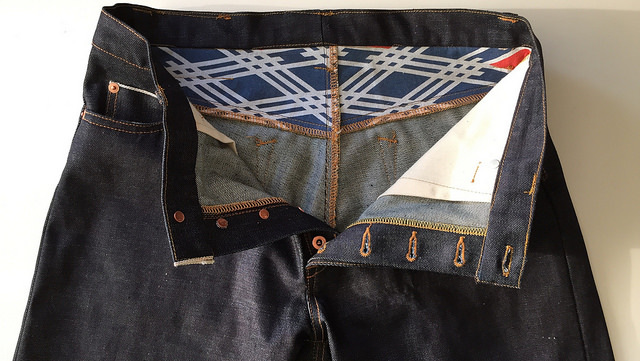 I’m afraid I would ruin my sewing machine stitching layers of denim fabrics. 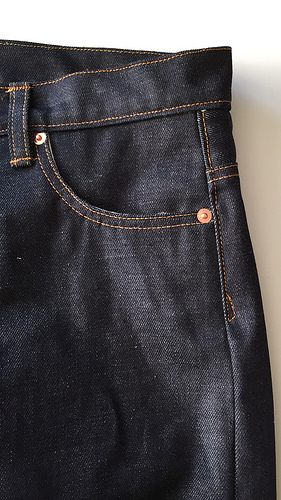 Maybe someday I can buy an industrial sewing machine that can be dedicated to making jeans. 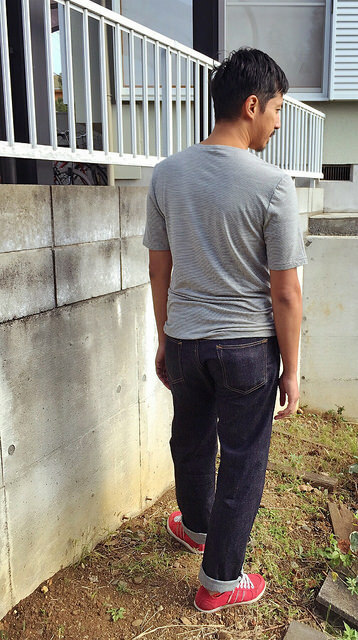 Jeans pattern is Mens’s jeans FOP-07 by Full of Patterns (PDF in Japanese), size L. How to buy from Full of Patterns.